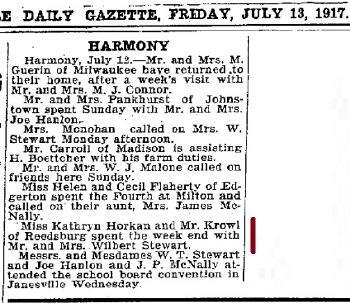 Harold C. Klostergaard married Ramona (?). Harold C. Klostergaard was born on 5 January 1926 at South Dakota. Harold C. Klostergaard died on 2 September 2005 at age 79. Harold C. Klostergaard obtained US Social Security Card at South Dakota; last residence Lake Zurich, Lake, Illinois. He lived in 1958 at Washington, Iowa. Married Name Her married name was Glade. Name Variation Katherine (?) was also known as Catherine (?). Name Variation Katherine (?) was also known as Katina (?). Katherine (?) married Christian Glade, son of Christian Glade and Rosina Grimmse. Katherine (?) was born on 4 October 1843 at Prussia. She died on 9 November 1894 at age 51. August Glade was born circa 1867 at Illinois. He was the son of Christian Glade and Katherine (?). August Glade died before 1951. Sophia Glade was born circa 1869 at Illinois. Sophia Glade died before 1951. Louisa Glade was born circa 1871 at Illinois. Louisa Glade died before 1951. Henry Glade was born circa 1873 at Illinois. Henry Glade died before 1951. Name Variation Doris Glade was also known as Dorothy. Doris Glade was born in October 1874 at Illinois. Doris Glade died before 1951. [S245] U.S. Federal Census 1900 U.S. Federal Census, by Ancestry.com, ED101. Dwelling 257. [S244] U.S. Federal Census 1910 U.S. Federal Census, by Ancestry.com, Sheet 3B. ED143. Dwelling 35. Rosina Glade was born circa 1877 at Illinois. Rosina Glade died before 1951. Name Variation Bernice Wilhelmina Ida Jurgenson was also known as Jurgensen. Married Name 2 April 1937 As of 2 April 1937,her married name was Grosenheider. Bernice Wilhelmina Ida Jurgenson was born on 4 April 1917 at Iowa. She was the daughter of William Jurgensen and Laura Klemme. Bernice Wilhelmina Ida Jurgenson married Fred William Grosenheider on 2 April 1937. Bernice Wilhelmina Ida Jurgenson died on 9 October 2011 at age 94 Bernice Grosenheider, 94, of Le Mars, died early Sunday, Oct. 9, 2011, at Plymouth Manor Care Center in Le Mars. Bernice Wilhelmina Ida Jurgensen was born April 4, 1917, on the family farm in Preston Township, the daughter of William and Laura (Klemme) Jurgenson. Bernice was baptized and confirmed at St. John Evangelical Lutheran Church in Preston Township. She attended Sunny Knoll country school near her home. Bernice was united in marriage to Fred William Grosenheider on April 2, 1937, at the church in Preston Township. The couple farmed near Craig, until the mid-1970s when their son Ken returned to the farm. They built a home southwest of Craig where they continued to help Ken on the farm. Fred died July 9, 2006. Shortly after Fred died, Bernice moved to Plymouth Manor Care Center in Le Mars. Bernice was a lifelong member of St. John Evangelical Lutheran Church in Preston Township. She participated with the choir, quilters, and circle for several years. When Bernice was not assisting Fred on the farm, she enjoyed cooking, gardening, canning, crocheting and other crafts. She was a very "busy and hard working" woman. She loved her children, grandchildren, and great grandchildren. Survivors include two daughters, Karen Bertsch and Jan Guerber, both of Minneapolis, Minn; a sister, LaVonne Baack of Le Mars; a brother-in-law, Robert and Violet Grosenheider of Le Mars; seven grandchildren; 20 great-grandchildren, and two great-great-grandchildren; and several nieces and nephews. 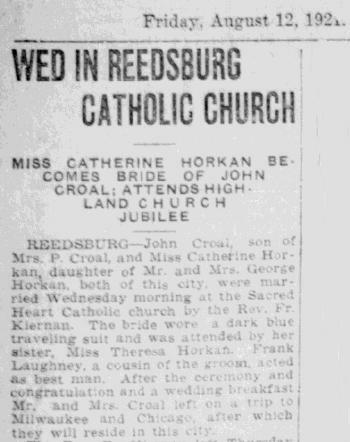 She was preceded in death by her husband Fred; parents, William and Laura (Klemme) Jurgensen; a son, Kenneth Grosenheider; a daughter, Ardis Schmitt; a grandson, Tony Schmitt; and three sons-in-law, C.T. "Smitty" Schmitt, Jerry Bertsch, and Tom Guerber; and five siblings: Norman Jurgenson, Bob Jurgenson, Leona Hartman, Marlene Eiacker, and Shirley Johnson. Funeral services will be 11 a.m. Tuesday at St. John Evangelical Lutheran Church, Preston Township, rural Akron, with Minister Joel Nye and the Rev. Sarah Nye officiating. Interment will at Resthaven Memory Gardens Cemetery in Le Mars. Visitation with the family present will be after 5 p.m. today (Monday) at the Carlsen Funeral Home in Le Mars. Pallbearers will be Lori Westhoff, Chris Grosenheider, Jeff Bertsch, Gena Nelson, Dan Schmitt, Tim Schmitt, and Greg Schmitt. Honorary casketbearers will be her great-grandchildren. Married Name 8 October 1936 As of 8 October 1936,her married name was Hartman. Leona Beatrice Jurgenson was born on 22 March 1919 at Akron, Plymouth, Iowa. Leona Beatrice Jurgenson was baptized on 20 April 1919 at Immanuel Lutheran Church, Plymouth, Iowa. She married Bill Hartman on 8 October 1936 at LeMars, Plymouth, Iowa. Leona Beatrice Jurgenson died on 20 November 2003 at age 84 Leona Hartman Leona was born on a farm in Iowa in 1919 to William and Laura Jurgenson. She lived on a farm until 1942 when Bill moved to California to work in the shipyards as a welder. Bill and Leona were married in 1936 and had 67 years together. Leona is survived by her beloved husband, Bill; daughter, Janice Burke and husband Pat; son, Richard Hartman and wife Barbara; a beloved son, Donald Hartman, who died in 1959. She is also survived by four grandchildren, Robert Hartman and wife Shelly, James Hartman and wife Angela, Susan Parker and husband Eric, and Shawn Burke; eight great grandchildren; sisters, Bernice Grosenheider and husband Fred, Lavonne Baack, Marlene Eichacker and husband Lloyd; brother, Robert and wife Beverly; sister-in-law, Ruth; plus many nieces and nephews. She was predeceased by her parents; brother, Norman Jurgenson; and sister, Shirley Johnson. Leona was always active in church activities at Trinity Lutheran Church and was an altar guild chairman for many years. A Memorial Service will be held on Wednesday, November 26, 2003 at 1:00 p.m. at Trinity Lutheran Church, 3301 Morningside Drive, Richmond, CA 94803. Private inurnment at Sunset View Cemetery, El Cerrito. She was buried on 26 November 2003 at Sunset View Cemetery, El Cerrito, Contra Costa, California. Name Variation Donald Norman Jurgenson was also known as Jurgensen. Name Variation Donald Norman Jurgenson was also known as Norman. Donald Norman Jurgenson was born on 30 March 1924 at Iowa. He was the son of William Jurgensen and Laura Klemme. 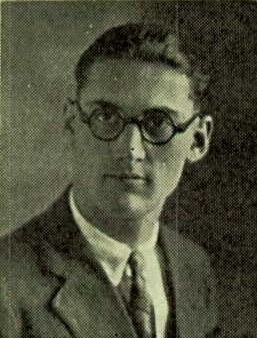 Donald Norman Jurgenson married Ruth Brunken on 16 February 1947. Donald Norman Jurgenson died on 19 March 1963 at Plymouth, Iowa, at age 38 Donald Norman Jurgensen obituary. He was buried after 19 March 1963 at Saint Johns Cemetery, Craig, Plymouth, Iowa. Married Name 22 August 1948 As of 22 August 1948,her married name was Baack. LaVonne Lorraine Jurgenson was born on 26 May 1928 at Iowa. LaVonne Lorraine Jurgenson married Donald C. Baack, son of Carl Baack and Katherine Plueger, on 22 August 1948. LaVonne Lorraine Jurgenson died on 20 October 2012 at age 84 LaVonne Baack, 84, of Le Mars passed away Saturday, October 20, 2012 at the Plymouth Manor Care Center in Le Mars. Her funeral will be 10:30 a.m. Wednesday, October 24, 2012 at St. John Lutheran Church in Craig, Iowa with Minister Joel Nye and Pastor Sarah Nye officiating. Interment will follow in the church cemetery. Visitation with the family present to greet friends will be after 5:00 Tuesday, October 23, 2012 at the Carlsen Funeral Home in Le Mars followed by a 7:00 p.m. Prayer Service Tuesday evening at the funeral home. Visitation will continue Wednesday morning at the church from 9:30 a.m. until service time. Pallbearers will be Troy Haage, Kurt Haage, Terry Klemme Barry Jurgenson, Roger Jurgenson, and Brandan Berkenpas. Honorary casket bearers will be her grandchildren, Eric Baack, Jesse Baack, Daniel Baack, Jenna Bachman, Joe Bachman, Mallory Berkenpas, and Madison Baack. LaVonne Lorraine Jurgenson was born May 26, 1928 on the family farm near Akron, Iowa to William and Laura (Klemme) Jurgenson. LaVonne attended country school near her home. She was united in marriage to Donald Baack on August 22, 1948 in Akron. Don and LaVonne farmed in Grant Township for several years and later moved to Le Mars in 1971. Don passed away on March 19, 1980. In 2007, LaVonne moved to Prime Living Apartments. LaVonne was a longtime member of St. John Lutheran Church in Craig where she enjoyed participating in Circle and volunteering for church activities. She also enjoyed playing pinochle, bowling in league, and baking pies. Her greatest joys in life was spending time with her grandchildren and great grandchildren. Survivors include her children: Dennis Baack and his wife Shannon of Sheldon and their children, Eric and Donna Baack and children Jacob and Caleb, Jesse and Valarie Baack and children Isaac, Savannah, Jada, and Briggs and Daniel Baack; Susan Bachman and her husband Tim of Aurora, Colorado and their children, Jenna Bachman and her fiancé Uriah High and son Quincey and Joe Bachman; James Baack and his wife Brenda of Le Mars and their children Mallory and Brendan Berkenpas and Madison Baack; a sister-in-law, Doris Haage of Le Mars; 2 brothers-in-law, Duane and Peg Baack of Littleton, Colorado and Bill Johnson of Longmont, Colorado; and several nieces and nephews. She was preceded in death by her parents, William and Laura (Klemme) Jurgenson; her husband, Donald Baack on March 19, 1980; 4 sisters, Shirley Johnson, Marlene (Lloyd) Eichacher, Bernice (Fred) Grosenheider and Leona (Bill) Hartman; 2 brothers, Robert (Bev) Jurgenson and Norman (Ruth) Jurgenson; and a sister-in-law, Dorothy (Wilmer ) Klemme, and a brother-in-law Donald Haage. Louise M. Mollet was born circa March 1918 at Oregon. She was the daughter of Roy H. Mollet and Elizabeth A. Small. [S243] U.S. Federal Census 1920 U.S. Federal Census, by Ancestry.com, ED79. Dwelling 217. [S250] U.S. Federal Census 1930 U.S. Federal Census, by Ancestry.com, ED26-206. Dwelling 143. Roy Allen Mollet was born circa January 1920 at Oregon. He was the son of Roy H. Mollet and Elizabeth A. Small. Theodore Small was born circa 1902 at Oregon. He was the son of (?) Small. Name Variation Emily (?) was also known as Emma J. (?). Married Name circa 1869 As of circa 1869,her married name was Masterson. Emily (?) was born in June 1843 at Kentucky. She married Thomas Masterson circa 1869. Emily (?) died before 1920. Emily (?) had 4 with 3 living in 1900 children. [S246] U.S. Federal Census 1880 U.S. Federal Census, by Ancestry.com, ED78. Family History Library Film 1254434. Sheet 388C. Dwelling 84. [S245] U.S. Federal Census 1900 U.S. Federal Census, by Ancestry.com, ED41. Dwelling 162. Name Variation James R. Masterson was also known as Jimmie R.
James R. Masterson was born in November 1872 at Kentucky. He was the son of Thomas Masterson and Emily (?). Sallie A. Masterson was born in October 1875 at Kentucky. She was the daughter of Thomas Masterson and Emily (?). Maggie Masterson was born in September 1879 at Kentucky. Maggie Masterson died before 1900. Mark Wells married Mary J (?). Mark Wells was born circa 1882 at Kansas. [S243] U.S. Federal Census 1920 U.S. Federal Census, by Ancestry.com, ED150. Dwelling 42. Mary J (?) married Mark Wells. Mary J (?) was born circa 1889 at Missouri. Dora M. Wells was born circa 1911 at Missouri. She was the daughter of Mark Wells and Mary J (?). Harvey W. Wells was born circa 1914 at Kansas. Margaret M. Wells was born circa 1916 at Kansas. James F. Wells was born circa 1918 at Kansas. He was the son of Mark Wells and Mary J (?). Name Variation Lawrence P. Dwyer was also known as Lawrence A.
Lawrence P. Dwyer was born on 9 August 1906 at Richland, Wisconsin. 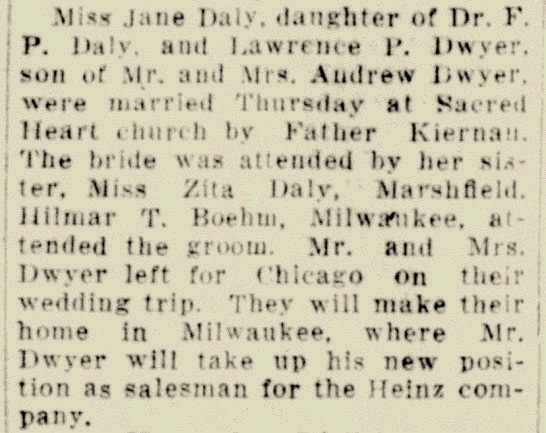 Lawrence P. Dwyer married Jane Claire Daly, daughter of Dr. Francis Peter Daly and Anna Mary Joyce, in October 1929 at Wisconsin Jane Daly and Lawrence P Dwyer marriage announcement; her 1st marriage. Lawrence P. Dwyer died on 5 December 1953 at age 47. Lawrence P. Dwyer graduated in 1926 at Reedsburg High School, Reedsburg, Sauk, Wisconsin. 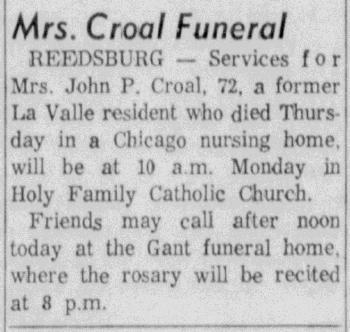 Married Name circa 1929 As of circa 1929,her married name was Croal. Agnes G. Gleason was born in April 1892 at Wisconsin also reported as Apr 1891. She was the daughter of Michael Gleason and Bridget Margaret McHugh. Agnes G. Gleason married John Patrick Croal, son of Patrick E. Croal and Maria Daly, circa 1929. Agnes G. Gleason witnessed the death of Bridget Margaret McHugh on 2 May 1943 at home of her daughter, Mrs. John Croal, Chicago, Cook, Illinois; Mrs Michael Gleason (Bridget McHugh) obituary. 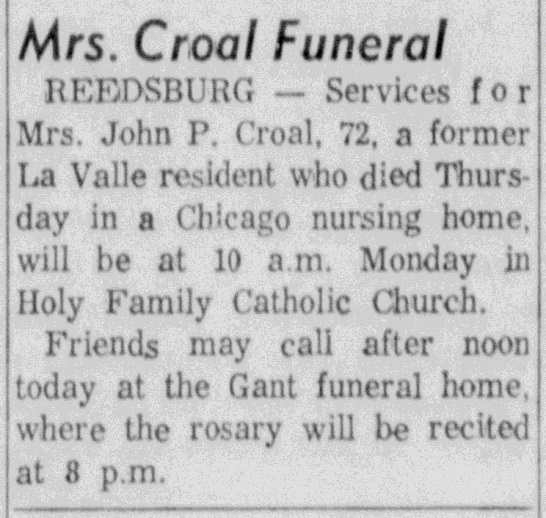 Agnes G. Gleason died on 3 December 1964 at Chicago, Cook, Illinois, at age 72 Mrs. John P Croal (Agnes Gleason) obituary; Mrs. John P. Croal, 72, Chicago, formerly of La Valle, died Thursday at Chicago. Gant funeral home, Reedsburg. Name Variation Catherine A. Horkan was also known as Katherine. Name Variation Catherine A. Horkan was also known as Kathryn. 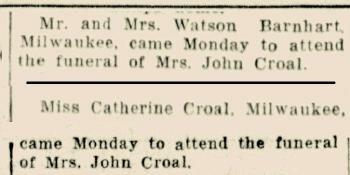 Married Name August 1921 As of August 1921,her married name was Croal. Catherine A. Horkan was born in May 1889 at Wisconsin. She was the daughter of George Horkan Sr. and Bridget Ellen Davenport. 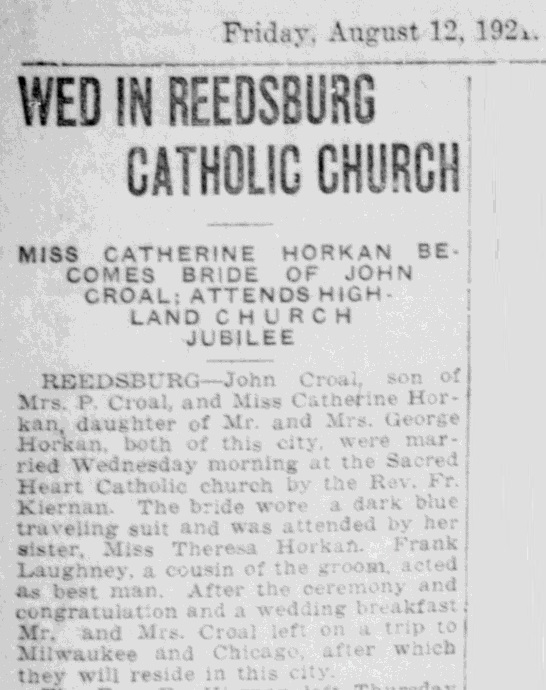 Catherine A. Horkan married John Patrick Croal, son of Patrick E. Croal and Maria Daly, in August 1921 at Reedsburg, Sauk, Wisconsin, Catherine Horkan and John Croal wedding announcement. Catherine A. Horkan witnessed the probate of the estate of George Horkan Sr. in May 1927; Decision upheld by high court regarding assets of estate of George Horkan to Catherine Horkan Croal. Catherine A. Horkan died on 25 November 1927 at age 38. 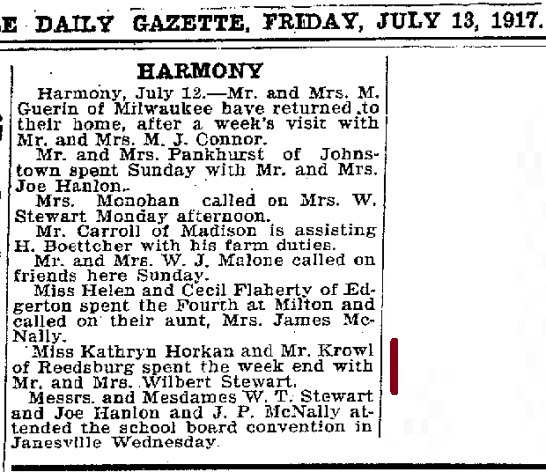 In July 1917 at Wisconsin Miss Kathryn Horkan and Mr Krowl (Croal) visited the Wilbert Stewarts. In April 1925 at Reedsburg, Sauk, Wisconsin, Mrs. P. Croal and daughter, Reta, Milwaukee, are spending the week in the home of her son, Mr. and Mrs. John Croal. 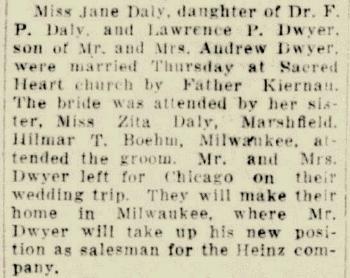 In August 1925 at Sauk, Wisconsin, Misses Della and Theresa Horkan of Chicago are spending the week in the home of their sister Mrs John Croal. In June 1927 at Chicago, Cook, Illinois, Mrs John Croal visiting her Horkan sisters, with Miss Helen Winnie. [S245] U.S. Federal Census 1900 U.S. Federal Census, by Ancestry.com, ED130. Dwelling 119. [S364] Wisconsin State Census Wisconsin State Censuses, 1895 and 1905, by Ancestry.com, Dwelling 22. [S244] U.S. Federal Census 1910 U.S. Federal Census, by Ancestry.com, ED111. Dwelling 70. [S243] U.S. Federal Census 1920 U.S. Federal Census, by Ancestry.com, ED175. Dwelling 53. Alta M. Krueger married Harold Baumgarten, son of August G. Baumgarten and Bertha Huebing. Alta M. Krueger was born on 3 January 1911. She was the daughter of Frederick G. Krueger. Alta M. Krueger died on 25 May 1988 at age 77. Alta M. Krueger obtained US Social Security Card at Wisconsin; last residence Madison, Dane, Wisconsin. [S273] Wisconsin Sauk County, Wisconsin Cemetery Records, page 121.